Can be a beautiful, elegant gift for all occasions. Shipped in knock down manner and can be assembled without any need of a carpenter. The temple is mounted on circular at the base and there are two drawer at the base area along with sliding tray where you can place you deity and lighten up your diya or incense sticks.Above that their is a main place for the deity where you can place your idols and worship them there is wooden jaali work done over at the back and at the ceiling of the temple.At the top of the roof there are three domes placed along with shikhara at the top.there is holy sign “OM” and floral carving done by our skilled artisans. 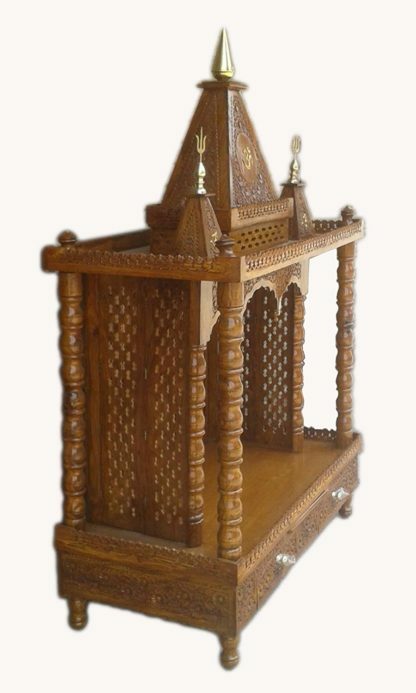 The temple is made up of premium quality seasoned Sheesham wood and is best suitable for the home and for the offices. The temple is in Sheesham Wood except for the base where idols are to be placed and the ceiling where dome is placed which is in premium quality plywood. These Indian Wood Mandir are used and appreciated for worships as well as interior decorations. They are very modern and made of the wood. 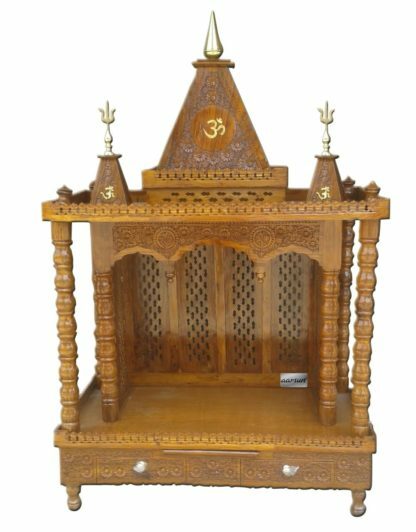 The unit is made carefully keeping in mind all the usual requirements of a customer.The Mandir is made from Sheesham Wood which is famous for its long lasting durablity and have its own spiritual significance. We provide a wide range of designs in Wooden Temples that can be customized as per your requirement. Contact us for a different Size.